Too Many Chickens! » Blog Archive » While you’re waiting . . . While you’re waiting . . .
Garden Guys won’t be broadcasting again until the new year, but don’t worry, I have stuff to fill those Fridays. For now, here’s a podcast my friend Even does called Necessary & Sufficient, in which he mails you two words, and then you have to talk about those words with him. I did this recently, and you’ll be shocked to know that I got two words relating to chickens, and off we went. 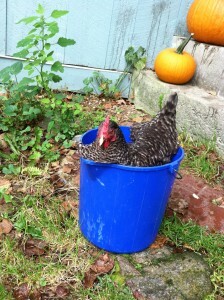 Also, here’s a chicken in a bucket. I thought the chicken was supposed to be in a basket. This entry was posted on Friday, November 29th, 2013 at 5:16 pm	and is filed under Backyard chickens. You can follow any responses to this entry through the RSS 2.0 feed. You can leave a response, or trackback from your own site. This page took 0.216 seconds of computer labor to produce.